Surfing is a culmination of experience, skill, patience, and a little luck. The more knowledge you have of the rising and falling tides, sunrises, and sunsets in a particular area, the better chance you have of standing up on some waves. Traditionally this meant studying information on the internet, chatting with the locals, or watching the ocean from the pier before setting out into the water. Nixon’s new Base Tide Pro is a game-changer for surfers — featuring more than 500 preprogrammed tides and sunrise/sunset locations. Whether you’re an amateur or a pro, you can easily utilize the information and spend less time searching for surf and more time out in the water. The Base Tide Pro offers tide time and height data for 550 locations around the world — collected over the past 15 years. 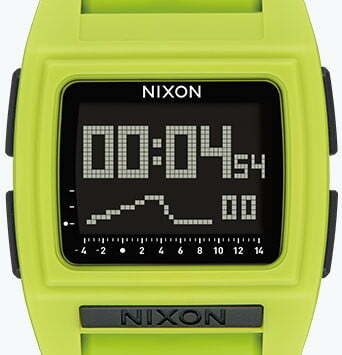 This watch isn’t just designed to help you find surf but also to join you on the ride. The Base Tide Pro features a TR90 case with hardened mineral crystal and water resistant pushers — allowing you to spend more time out in the water. 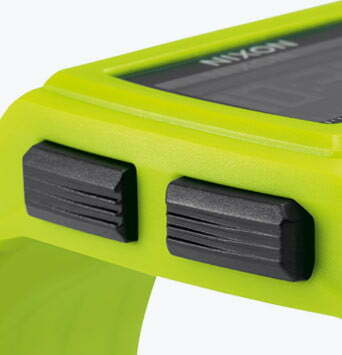 The case is truly surf ready, rated to 100 meters and including a stainless case back. 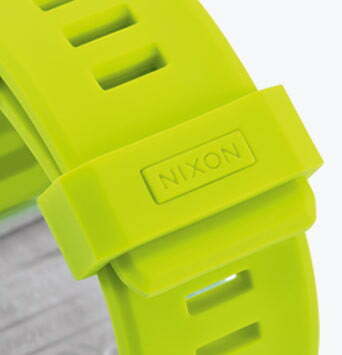 The wrist strap is made of silicon but includes a stainless steel buckle and screw bar connections that adjust to your wrist size. A double-locking looper ensures that the strap stays put whether you catch some major air or get pulled under in a massive close out. 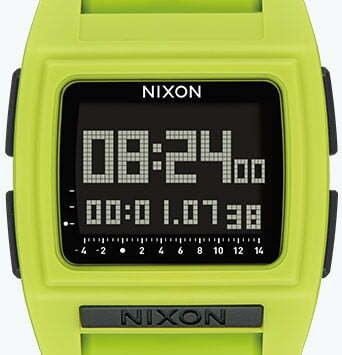 The watch features a chronograph and provides for split screen functions. A countdown timer is preset and customizable, providing for a manual wave counter. In addition, there are three types of alarms available — one time, daily, or weekday specific. 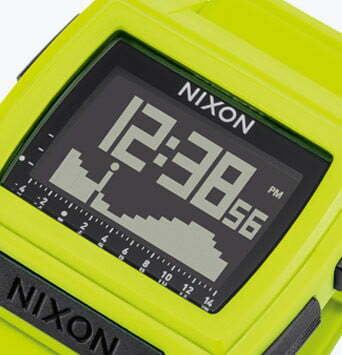 The dial is a negative LCD, featuring a printed tide graph. Whether you’re setting out on an exotic surf trip or heading down to the local beach, Nixon’s Base Tide Pro is tough enough to go with you and intelligent enough to ensure you don’t waste a journey. 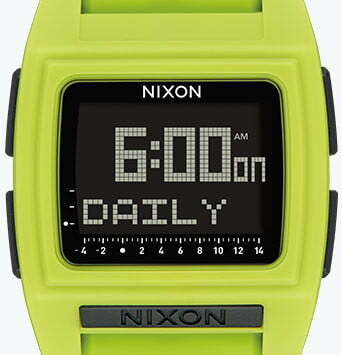 The watch measures 42mm and is available in black, dark slate, gray, lime, orange, seafoam, and surplus. The Base Tide Pro retails for $125 on the company’s website.